BBC NEWS | Middle East | Who is behind the violence in Iraq? Iraqi sociologist Faleh A Jabar examines which groups might be responsible for the continuing violence against coalition troops in Iraq. Four months into the post-Saddam era, anti-coalition violence seems, on the surface, vibrant and possibly on the upsurge. The violence appears to stem from a multitude of sources and causes in which politics, ideology, culture, poverty and blunders by the Coalition Provisional Authority (CPA) are to blame. While most Iraqis do not support the politics of violence, they do not effectively oppose it either - one of the many paradoxes in the Iraqi puzzle. There has been a steady stream of attacks since the occupation began - targeting utilities and oil facilities, but mostly US troops. US Defence Secretary Donald Rumsfeld dismissed these as isolated and fragmented acts, but in mid-July the new Centcom commander, John Abizaid, said coalition forces were facing what looks like a systematic guerrilla war. The violence appears to be well-organised and continuous. It benefits from a general atmosphere of discontent, wounded national sensibilities, penalised marginal groups, Arab and Iranian media agitation, good funding, and the CPA's self-imposed isolation from the public and the cultural blunders it has made in dealing with local communities. Although political and ideological violence is still detached from mainstream institutional engagement or peaceful street politics, it may well gain strength if and when hardships continue. The war to win peace, to win the hearts and minds of Iraqis, and, above all, to help them return to normality and regain ownership of their own country, has become a decisive issue. Sensational Arab and world coverage of the violence in Iraq depicts it as an overwhelming national resistance movement. But a closer look reveals it is confined to two enclaves: the rectangle of Fallujah-Balad-Dloiya-Yusufiya in Anbar province west and north-west of Baghdad; and the area around Baquba in Diyala province, east of Baghdad. Anbar province stands to lose much in the post-Saddam era. It had two presidents, several prime ministers and a large number of cabinet ministers, hundreds of military commanders, and thousands of wealthy businessmen. The province contains an explosive mix of Arabism, radical Islam (Salafi Wahhabism), and very rigid tribalism, all overshadowed by fear of uncertainties and a deep sense of loss. It flourished under the Baathists and now feels marginalised. 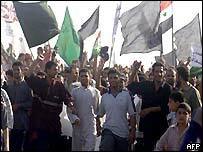 There is, however, also a silent majority in Anbar province who oppose violence and wish to carry on business as usual. Unlike Anbar, Diyala province is of mixed ethnic nature. In addition to Arabs, Kurds and Turkoman populate the eastern areas of this poor, peasant province. The lower, Arabic part, however, is almost a replica of Anbar in cultural terms. There is a strong Sunni fervour and a strong tribal spirit, combined in one through Sufi orders. Tribes have been patronised by the deposed president in cash and kind. The Iraqi Islamic party has also been active on the streets in several towns of Diyala province, notably the centre, Baquba. As is the case in Anbar, a strong anti-American atmosphere overshadows parts of the region. Rumours suggest Saddam Hussein at times took refuge among tribesmen in rural parts of the province. The number of attacks there has surged since the elimination of his two sons on 22 July. One or two pockets of resistance may also exist in the northern city of Mosul, while the south seems quiet apart from some incidents in al-Majar al-Kabeer village in Omara province in early July. Kurdistan, by contrast, has become a holiday resort for coalition troops: peaceful, friendly and with moderate temperatures. So who is behind the violence? One broad, but vague, answer is Saddam Hussein's loyalists. But who are they, and are they alone? The old intelligence-security organisations, with an estimated 30-50,000 people, melted away in early April and went underground. They enjoy a wealth of expertise in underground operations, motivation and human resources, not to mention billions of dollars. 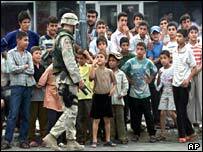 The decision by the US administrator in Iraq, Paul Bremer, to disband the army and the interior ministry horrified and alienated members of these departments and drove many of them into clandestine regrouping. Looting and fire destroyed precious archives that could have helped vet intelligence and security officers. Government offices were methodically set ablaze by loyalists themselves to hide their trails. According to a secret letter signed by the general director of the Intelligence Bureau (Mukhabarat al-Amma) shortly before the fall of Baghdad, officers were instructed to destroy documents, offices and any incriminating evidence. They were also directed "to join the Islamic parties" on both sides of the communal divide. A second group actively involved in masterminding attacks is believed to be the Salafis, or Wahhabis. This is a radical Islamic group with strong anti-US ideological antipathy. Their concept of Jihad, holy war, is unique. Their view is that any kafir, or non-Muslim, who trespasses on Islamic land by force is an illegitimate invader who should be fought. Fighting the invader, they argue, is a universal imperative on every adult Muslim in good physical and mental health. Iraqi Salafis have good contacts with their ideological comrades in Saudi Arabia and in the Kurdish mountains. A third and possibly overlapping group are the Arab volunteers - mostly Islamic fundamentalists of Jordanian, Palestinian, Syrian, and possibly Yemeni origins. Baghdadi families said that hundreds of these Arab volunteers (of whom there are about 6,000-7,000 in total) have been trapped in Iraq. They have wanted to leave the country but have been unable to cross border checkpoints. They have run out of cash and are being housed by families who provide for them out of compassion for their misery rather than sympathy with their cause. These warriors of misfortune are looking for a safe exit. A fourth type is a non-ideological, tribal avenger motivated by retaliation. In coalition raids and skirmishes, non-combatant civilian families and clans, who seek retaliation, have sustained loss of life. Indeed many civilians have been shot dead in the towns of Fallujah, Mosul, Baquba in Diyala province and al-Majar al-Kabeer village in Omara province. 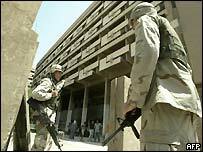 Another source for such reprisal is the clans and extended families of Iraqi soldiers who fell in combat. According to a military commander with a tribal status, about 6,000 servicemen lost their lives during hostilities. About 10-20% of them may have had strong tribal affiliations. Some tribes approached the coalition authorities demanding blood money for their sons but were told that no compensation would be paid for Iraqi soldiers killed in action. Revenge, in this and other cases, could be easily contained. Soldiers of fortune could well constitute a fifth group taking violent action against coalition forces. Given that society has been militarised for such a long time and impoverished for a decade or so, significant numbers of young people have been more inclined to make their living by the gun. Thus, violence in post-war Iraq has different, and sometime conflicting sources. It is of political, ideological, cultural or economic origin. Faleh A Jabar is an Iraqi sociologist based in London. He is a research fellow at Birkbeck College, University of London. His latest publications include The Shia Movements of Iraq, Ayatollahs, Sufis and Ideologues, State, Religion and Social Movements in Iraq and Tribes and Power in the Middle East.